Auriculartherapy is the diagnosis and treatment of body disorders through the assessment and stimulation of reflex points on the outer ear. It is used extensively in China, USA and Europe, especially in France, where scientific research has validated its effectiveness. 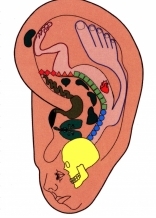 Ear work combines perfectly with both reflexology and remedial massage. It has been shown that treating more than one micro-system increases therapeutic effectiveness. Also with the placement of magnetized pellets on selected points on the ears, the treatment continues throughout the week between sessions so that the improvement in the client’s condition holds longer than would otherwise be experienced in a series of sessions. Most health disorders can be treated such as pain, neuralgia, anxiety states, depression, addictive behaviour, migraines and skin conditions. It is particularly effective for the treatment of muscular-skeletal conditions. To understand and be able to apply auriculartherapy within your existing therapeutic practice. The focus will be on muscular-skeletal complaints, however at the end of the workshop, with the use of the manual, you will be able to select and apply treatment protocols for a wide range of complaints relating to other body systems. 1. Diagnosis. It provides an efficient and scientifically proven means of diagnosing areas of pain and pathology. Together with the analysis of other reflex areas, it will give the therapist a more complete picture, and therefore a more precise treatment regime can be designed. 2. Interfaces easily with other forms of reflexology and with massage. 3. Foot and hand injuries. When the reflexes in the feet or hands cannot be worked due to injury, surgery or amputation the ear is an excellent alternative. 5. More efficient time spent with client. 6. Proven effective for psychological problems and addictions. 7. Special homeostatic balance points.